Biography of Atul Prasad Sen was written by Manasi Mukhopadhyay. Biography of Atul Prasad Sen.
A true Biography of Atul Prasad Sen was written by Manasi Mukhopadhyay, ebook pdf. It is very rare collection book. Students who are research about the biography of Atul Prasad Sen, can very helpful to them. Atul Prasad Sen was a great renowned poet, patriot, an eminent lawyer, Educationist, Philanthropist and also great politician in India. He was fearlessly independent but always moderate in his counsels and in his action. He was a clean fighter and a very fair advocate. He also known as writer. Rabindranath Tagore, Kazi Nazrul Islam, Rajanikanta Sen and Dwijendralal Ray are best lyricist and also well-known as poet, but Atul Prasad Sen is not not well known as a poet, he has gained universal recognition as a lyricist. The most favorite Geetigunja Bengali Poem and Songs Book was written and published by Atul Prasad Sen . The biography of Atul Prasad Sen was written by Manasi Mukhopadhyay. She has try to written the biography in every part of his life very clearly with truth. We have received very few books in full description of the Atul Prasad Sen. So readers can know the whole part of Atul Prasad Sen from this golden book. Atul Prasad Sen said in his speech as the president of Liberal Federation Party Congress which held on 21st October,1933 about the Communal problem in India, given below. “The gravest means to harmonium progress was the existence of communal discord. Hindus, Muslims Christians and other religious communities of India must cultivate religious of the Harijans with such devotion. The communal Unity could not be achieved by the mere adjustment of electorates or the allotment of offices and favours. Without Unity of heart, which could only be brought about by the mutual tolerance, there could be no communal concord in India. The necessity of the social reconstruction of Hinduism in the interest of national salvation was urged by the speaker who express gratitude to Mahatma Gandhi for talking up the cause of the harijans with such devotion. Readers can get the true Biography of Atul Prasad Sen by Manasi Mukhopadhyay as ebook pdf file from this page below. A true Biography of Atul Prasad Sen by Manasi Mukhopadhyay pdf. 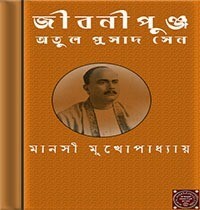 Biography of Atul Prasad Sen by Manasi Mukhopadhyay.